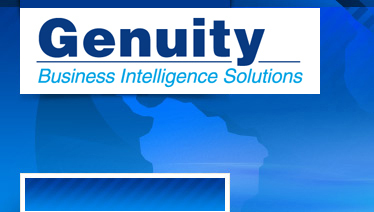 Genuity Business Intelligence Solutions Inc.
Conatct us for your business intelligence software and consulting needs. We help businesses by delivering information in order to make informed decisions leading to better overall performance. How Business Intelligence can help you? Business Intelligence takes the raw data you have and turns it into meaningful reports so you can understand where and how to better manage the organization in order to get better results. You will spend less time debating what the data means and more time using the information gained from the data. All this leads to timely informed decisions, and a quicker response to threats and opportunities across the organization. SAP is the world's largest business software company – with more than 54,000 employees in more than 50 countries worldwide. SAP BusinessObjects™ extensive product portfolio provides your company with a solid foundation to get ahead of the competition. Copyright (c) 2013 Genuity Business Intelligence Solutions Inc. All rights reserved.